»What You Should Know About High Altitude Trekking! What You Should Know About High Altitude Trekking! Travelling at high altitudes deserves a little more respect than a normal vacation. At high altitudes, the air gets thinner and there is less oxygen to breathe. This makes every single task more difficult, you would find yourself getting tired and exhausted faster. Elevations which are above 8000 ft are said to be high altitudes. Most people can go up to 8000 ft with minimal consequences. But if you haven't been in a high altitude location before, it is very important to be cautious. 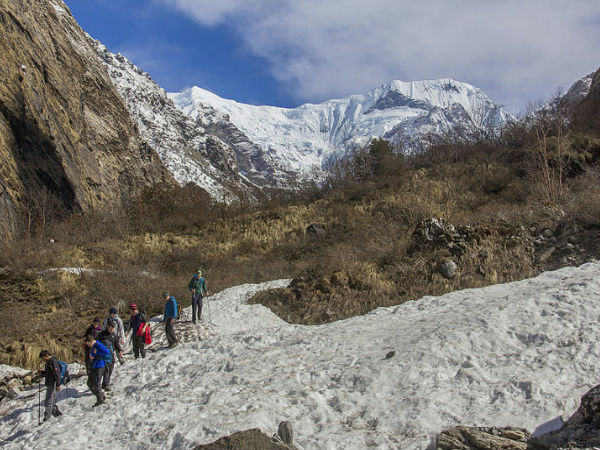 Read More : Tips To Safe Trekking! People in good health should not be alarmed by this piece. But, if you have a medical condition like high blood pressure, heart or lung diseases, it is highly advised to consult your doctor and take his advice before trekking. With a diet that includes drinking a lot of fluids, eating healthy food and getting a good amount of rest, one can make a painless trek and also a great vacation. You are very likely to experience some physiological problems, until your body gets acclimatised to the higher altitudes. The uneasiness varies from person to person, for some it may be just a day and or others it may take up to five days. So here is what you should know about trekking at high altitudes. During this period, you may experience many symptoms like headache, nausea, vomiting, insomnia or poor sleep, loss of appetite, lethargy and fatigue, difficulty in breathing, and shortness of breath. This is termed as Altitude Sickness or Acute Mountain Sickness (AMS). If you do develop symptoms, they will pass in a few days. However, if you do not help your body to adapt (by resting, and drinking plenty of non-alcoholic fluids) your symptoms might get worse. If the symptoms are not handled with care, it could then develop into something serious, like fluid entering the lungs, and the brain cavity. If they are not immediately attended to, you might even die. Though bottled oxygen may provide relief, it will not fix someone suffering from advanced Altitude Sickness. Even if you are part of an organised climbing or trekking group and happen to have one, it will only provide temporary relief. If there is still no relief, there is one simple cure - descend, descend, descend! Once you are at lower altitudes the symptoms will reduce and you will become normal almost immediately. Diamox helps to reduce AMS to an extent, however it is not a total cure to AMS. Be alert after crossing 3000 m(1000 ft). Climb high and sleep low, you can climb more than 1500 ft in a day but make sure you come down and sleep at a lower altitude. Take a day at a similar altitude, it will help you to adjust to the environment.. If you begin to show signs of altitude sickness, do not force yourself to scale greater heights until the symptoms decrease. Always keep in mind the acclimatisation differs from one person to another, so always keep an eye on your fellow trekkers. Make sure all your team members are acclimatised before going into higher altitudes. Acclimatisation goes hand in hand with fluid loss, hence make sure you consume enough and more fluids to keep you hydrated. Go at slow pace, do not overexert yourself. Avoid tobacco and alcohol and other depressant drugs including sleeping pills. These depressants decrease the respiratory drive during sleep, which would result in worsening the symptoms. Have a high carbohydrate diet while at high altitudes. Consume Diamox 125mg, twice everyday, two days prior to reaching a high altitude.